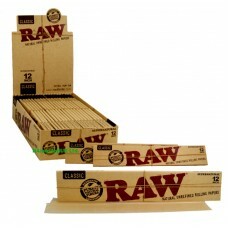 12" RAW supernatural classic unrefined extra long huge rolling paper. Extra long huge cigarette rolling paper from RAW, about 12" long. Original supernatural unrefined cigarette rolling papers, roll your own large size cigarette. Full box, contains 20 booklets. Features RAW classic supernatural 12" one feet rolling papers.